Screens with a 1024×768 resolution are a bit like Windows XP: there have long been better options, but they still remained the most often used screens on the web. That is, until now. According to the latest data from StatCounter, 1366×768 screens just surpassed 1024×768 as the most popular screen resolution used by the visitors to StatCounter’s global network of sites. Three years ago, 1024×768 still accounted for almost 42% of all visitors to the roughly three million sites that use StatCounter. 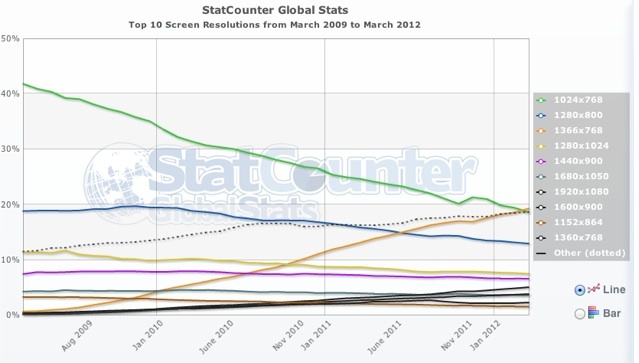 Today, that number has fallen to 18.6% and 1366×768 screens now account for 19.28%, up from just 0.68% in May 2009. It’s worth noting that these are global numbers. In Europe, the higher-resolution screens already overtook their predecessors late last year and in the U.S., 1024×768 still holds on to the top spot (but just barely). Another resolution that is slowly declining in usage is 1280×800. This used to be an especially popular resolution on laptops, but most modern machines now offer higher resolutions. For the most part, though, what sadly hasn’t changed much in recent years is the pixel density of these displays. This may change once Apple brings its Retina displays to its MacBook line, but right now, it’s almost as hard to find a small display with a very high resolution in a mainstream machine as it is to find a screen that isn’t widescreen. Among those who will be happy to hear these numbers is surely Microsoft, which long ago decided that it would target 1366×768 as the standard resolution for Windows 8. To effectively use Windows 8’s Metro user interface, for example, 1366×768 is the minimum resolution, though it will run on 1024×768 screens as well. According to Microsoft’s own statistics, only 1.2% of active Windows 7 users currently have screens with resolutions of less than 1024×768 and just under 5% still use 1024×768 screens.